I've received a few picture books in the mail recently for perusal and I thought I'd share them in list form with the rest of you. I'm growing more particular about picture books and weed through them more thoroughly. The ones listed here are ones that we've enjoyed reading through all together. 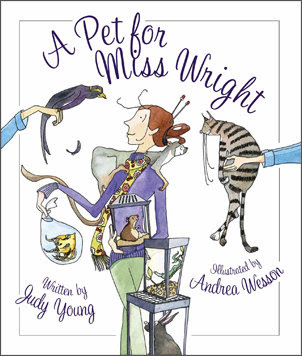 A Pet for Miss Wright is a new release from Sleeping Bear Press. Miss Wright is a writer, and a somewhat lonely one at that. She spends all day typing and writing out stories but lacks in companionship. She decides that it might be nice to have a pet and so makes a good many trips to the pet store trying to find the perfect pet to keep her company through the day as she works. Will she settle on a fish? A hamster? A cat? A dog? Well, you'll have to read the book to find out now, won't you? This one is super cute. I wasn't sure that Bookwworm1 would really connect with the idea of it very much but I needn't have worried. It being full of animals - how could we go wrong? (And I liked the writer/book angle.) Four thumbs up on this one! Not only does Bookworm1 like books about the zoo, but his little brother is becoming more and more fascinated with things like apes and elephants. (I think that's because they make loud noises!) Mommy always appreciates finding a good zoo title that can be read before we make our annual trip. Therefore, we were ALL delighted with The View at the Zoo which is a new release from Ideals Books. Told from the perspective of the animals, you just never know what kind of humans you might spot at the zoo! Humans do mighty silly things - like have their babies ride on their backs, and they eat a lot sometimes, and tend to become very excited by the things that they see. 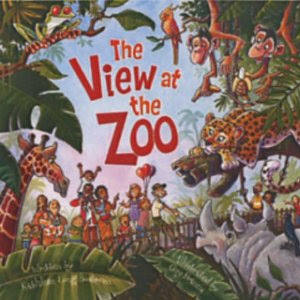 A cute book which takes a look at life in the zoo in front of and behind the bars - this one receives six thumbs up! The next two books come courtesy of Peachtree Publishers. 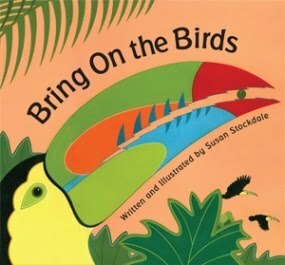 Bring On the Birds , by Susan Stockdale, is a very simple and straightforward read. The text is very easy to read, with very few words on each page. Each page displays Stockdale's artwork as she presents different fowl for us to inspect and enjoy. Bookworm1 (age 4 1/2) is probably too old for this book and declared it to be a "surprise fast read." I would say that it's a great, easy book for those with a shorter attention span. That said though, Stockdale does a beautiful job ill with her illustrations and it was very fun to look at all the different types of birds that exist in our world. 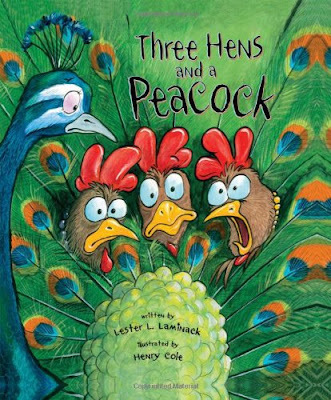 Three Hens and a Peacock , by Lester L. Laminack, introduces us to the quite farm life on the Tucker's farm. That is, it's all quiet until the peacock showed up! The peacock has no idea what farm life is like and doesn't know what to do but spread his feathers and shriek - which happens to attract a lot of attention. The farm animals are not impressed that they have to do all the work while the peacock gets all of the attention! The peacock wishes he could be more useful, but just does not know how. Eventually the other animals recognize the value of the peacock. A cute, funny story that has been enjoyed around these parts. I always enjoy your posts about picture books for kids. Maybe it's because M is the same age as B2 so we always enjoy the books you recommend. I just picked up I Spy Little Animals board book from the library last night. M was glued to it for the 20 min ride home from grandma's house.